UPDATE: It's not just falling fashion sales causing him problems. 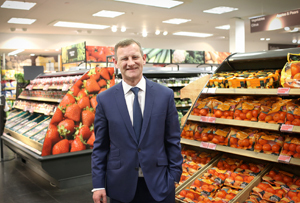 He officially took the reins of the retailer two months ago and CEO Steve Rowe’s just unveiled the first part of his strategy to make Britain fall back in love with M&S. Unfortunately, it may lose some of its lustre with investors in the process as Rowe warned improving its lagging clothing and home range will hit profits in the short-term. Pre-tax profits fell by 18.5% to £488.8m in the year to April 2, while revenue was up 2.4% to £10.6bn. The food division remained reliably on track – posting a 0.2% lift in sales, but the clothing arm suffered another slide, of 2.9%, during the year. The poor performance of the firm’s clothing business has been an ongoing headache for the retailer, but patching that up isn’t the only task on Rowe’s to-do list. It’s the biggie that Rowe’s predecessor Marc Bolland grappled with throughout his tenure and Rowe himself has said fixing clothes was his ‘number one priority’. Customers have been steadily losing interest in its womenswear, which has declined in almost every quarter for the past five years. This is something M&S has been visibly trying to rework – Bolland himself tried to revamp M&S clothes a number of times without much joy. General merchandise still accounts for some £4bn of sales for the retailer, so it can’t afford to simply throw in the towel to focus on its more successful food division. Slashing prices, making it clear who its lines are for and simply being more in tune with who the M&S customer is could make a big difference here. Rowe said he’d already cut the price of 3.5 million clothing items over the past couple of weeks. He said, ‘We are investing to re-establish our price position by sharpening prices and to enhance service by putting more employees into our stores. These actions, combined with the difficult trading conditions, will have an adverse effect on profit in the short-term. This ties in with the first point – retail is highly competitive. Not only has M&S failed to win on the fashion front, it hasn’t helped its cause with a slow-moving, unimpressive approach to ecommerce. A retailer of its size can’t neglect the online side of business to the extent it has done in the past – leaving it playing catch-up to savvier online upstarts like ASOS and fast fashion retailers like Zara. A new website launch was named as the reason for an 8.1% drop in sales back in August 2014, with reports of numerous would-be customers who couldn’t check out and items disappearing from baskets. Big shops used to be the route to bigger revenues, but the in the age of ecommerce that's no longer always the case. Rowe’s undoubtedly been poring over his store estate, figuring out where money can be saved. ‘The store portfolio is an area where we would expect Steve Rowe and Helen Weir [the finance boss] have been spending a significant amount of their time,’ the retailer’s sixth-largest shareholder, Columbia Threadneedle, told the Telegraph recently. The retailer’s already planning to close nine of its stores and relocate two others, but is also opening 90 new Simply Food stores as part of a programme aimed at ensuring M&S has stores in the right places. Expect a further shake up soon. Food sales good, clothing sales bad. That’s been the familiar summary of many M&S results over the past couple of years. In its full-year results, M&S said its food business accounts for around half of its profits and was continuing to perform well. Customers are keen on M&S food – that much is clear. Maintaining that momentum will be key to the retailer’s future. Particularly as many others have been dragged into an unsavoury price war in a floundering attempt to fend off the Aldi and Lidl onslaught. So far, customers have kept their appetites for M&S food – Rowe needs to ensure that continues. Expansion is very much on the agenda – M&S opened another 75 of its Simply Food outlets over the year and said these were already performing better than expected.